Connection using an Ethernet Module. Note: All other pins not shown in the above diagram have no connection. 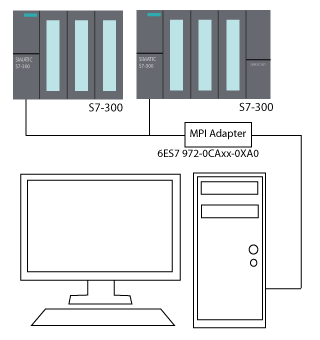 Configure one Siemens S7 MPI Channel Tag. Configure one Siemens S7 Serial PLC Tag for each PLC on the MPI bus. The Siemens PC and TS adapters support two RS-232 communication speeds: 19200 and 38400 Baud. The speed is selected by a switch on the side of the adapter. The Siemens HMI adapter supports only 9600 Baud. The Mode settings of the Siemens S7 MPI Channel Tag should match the RS-232 speed of the MPI Adapter. When powered up, HMI and PC adapters require configuration to join the MPI bus. The Fernhill SCADA Siemens S7 driver automatically configures HMI and PC adapters using the settings from the Siemens S7 MPI Channel Tag. TS adapters are configured offline using the Siemens Teleservice configuration tool. TS adapters retain their settings between power cycles. The Fernhill SCADA Siemens S7 driver does not configure TS adapters. For a detailed walkthrough about manually configuring tags for MPI connection refer to Configuring Tags for Siemens S7 MPI Communication. 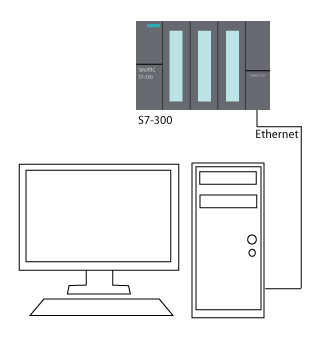 For a detailed overview of setting up an S7-300 or S7-400 Ethernet module refer to Siemens S7-300/400 Ethernet Connection Guide. If the Ethernet module configured, you can use the Siemens S7 TCP Autodetect Wizard to try and locate the PLC on the network. For a step by step guide to configuring tags for Siemens S7 MPI connected PLCs. For how to configure an S7-300/400 Ethernet module and Fernhill SCADA to work together. For how to search a network for Siemens S7 PLCs and automatically create tags for any PLCs found. For information on the Siemens S7 Driver.